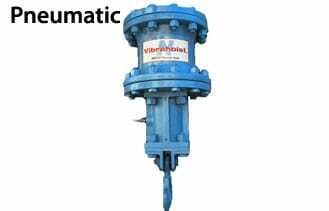 The Vibrahoist is designed to apply vibration to a suspended load. The unique action generated by the Vibrahoist transmits vibration to the load and isolates up to 98% of the vibration from the hoist and supporting structure for less wear and tear. Common applications for the Vibrahoist include removal of excess zinc during Hot Dip Galvanizing, it can be a valuable tool in the pickling process and the Vibrahoist is ideal for use in the drossing process. Suitible for loads up to 10,000 lbs. 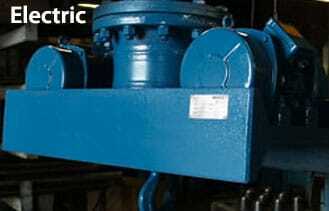 The Vibrahoist comes in both Electric and Pneumatic models. Conserves Zinc – The Vibrahoist reduces the amount of wasted material byremoving excess zinc from galvanized parts before it solidifies. Saves Labor – Grinding and Clean Up time are minimized by removing excessmaterial before it solidifies. The vibration generated by the Vibrahoist helps improve the overall finish of galvanized products and removes ‘dead spot’ between parts. 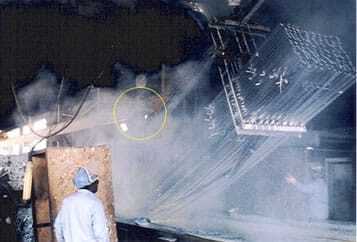 The Vibrahoist in use in a plant.